We have a lot of metrics that power dashboards and alerts around our production infrastructure. This includes our Rails frontend servers. We believe visibility is critical to being able to anticipate and act on any reliability or performance issue. Something we were lacking though was a complete picture of requests by Rails controllers and actions (in aggregate), that also included the average and upper percentile response latency. To subscribe to that event, you will want the bold code below to be placed somewhere that is only executed on application startup (versus on every page load). We put ours in an initializer block within application.rb but it could also go in its own config/initializers file. # send relevant info to metrics server, e.g. The great thing is we now not only have the overall response latency, but can track DB time and view rendering time per request, as well as in aggregate by controller, action, method and more. We ended up also sending this info to our ELK stack, so that we could get some succinct log statements for every single web request. In order for these new log entries to be a useful debugging tool in the event of investigations, there were a few things missing from the ActionSupport::Notifications event. We wanted access to the request uuid, as well as the logged in user and organization, if those were known in the session but not present in the url. That way we could tie the response timing data in with the full log output of the Rails log (by filtering on uuid). The nice thing with this append_info_to_payload method is that you have access to the request and response objects as well as the session object, giving you many options for what to include in the event payload. With the above changes deployed, we were then able to create some alerting thresholds around response latency (and at a finer granularity like Rails controller and action, or customer type, or even specific customer). And with all of this normalized data also flowing to our ELK stack, it was then trivial to create useful dashboards for web requests. 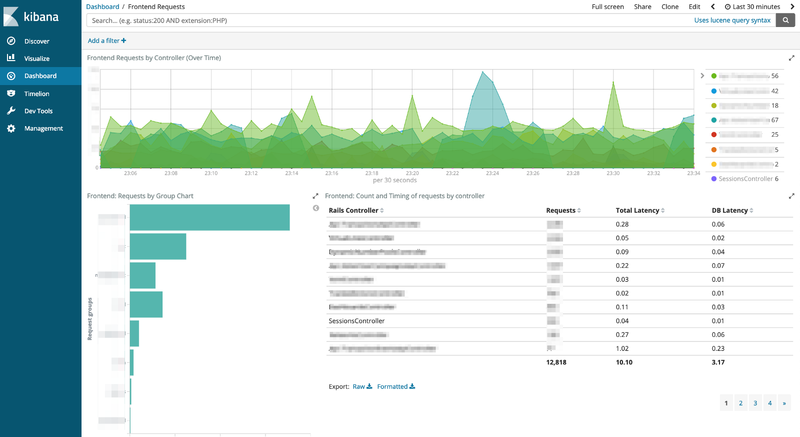 We can filter the dashboards down to a specific customer, controller and action, request method, request format and more when troubleshooting a possible issue. Rails provides many other instrumentation hooks that we are excited to explore and integrate into our monitoring and alerting stack now that we have this pattern established. See this Digging Deep with Notifications talk for some great information and ideas on what is possible. Let us know if you are using any of the available instrumentation hooks in creative ways too! Lead Architect at Invoca, Inc.